iPod Video Converter for Mac - Mac iPod Converter to convert video to iPod MP4. Mac iPod Converter, convert video to iPod MP4. 3herosoft iPod Video Converter for Mac is excellent and optimum Mac iPod Converter for Mac OS X users that can easily convert video to iPod MP4, H.264/MPEG-4 AVC video formats and iPod AAC, MP3 and MAV audio formats. Especially it also supports iPod MPEG-4 video at 640 by 480 resolutions. Most popular video formats are supported to convert to iPod video/audio files including AVI, DivX, XviD, WMV, MPEG, MPG, DAT, RM, RMVB, MOV, ASF, VOB, MKV, and FLV. It can also convert various audio formats like AAC, AC3, WAV, MP3, WMA, MP2, OGG and M4A to MP3, AAC, and M4A for playback on iPod, iPod touch, iPod touch 4, iPod shuffle, iPod nano, iPod nano 5, iPad and iPhone . In addition, it has almighty function of editing options, such as video trimming, video and audio encoder settings, split mode customizing and batch conversion. It converts files with fast speed while still maintaining the video and audio quality. Convert all popular video formats like 3GP, 3G2, MPEG, FLV, WMV, MP4, M4V, VOB, ASF, DAT, AVI, MKV, RMVB to iPod MPEG-4, H.264/MPEG-4 AVC video formats. Fast convert audios like WMA, AAC, AC3, WAV, MP2 to iPod M4A, WAV, MP3, AAC audio formats. Extract audios from videos like 3GP, 3G2, MPEG, FLV, WMV, MP4, M4V, VOB, AVI, MKV, RMVB to iPod M4A, WAV, MP3, AAC audios. Multiple input files can be converted to different profiles output that can be played on iPhone, iPod, iPad, Apple TV, PSP/PS3, Window Media and Mobile Phone respectively. Simultaneously convert multiple audio and video to iPod in a group, that is an amazing way to shorten video to iPod conversion time for Mac OS X users. This Mac iPod Video Converter can adjust the output file quality and effect by modifying the parameters in general video and audio setting panels. 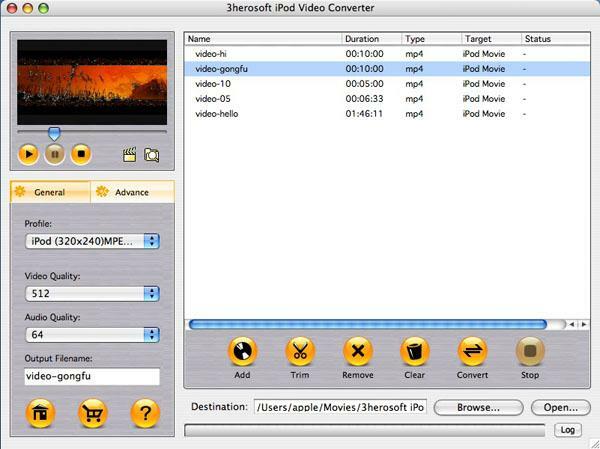 3herosoft iPod Video Converter for Mac allows you to trim the video by start and end point setting and cut off the part you dislike. You can also specify the video start time and duration to extract one video segment to output. In order to meet your need most, this Mac iPod Converter provides iPod video formats with different quality or parameters for your iPod. Allow you to preview the source file with the built-in player before conversion. Manually edit ID3 info like title, album, year for perfect music management when converting files to MP3 music. How to convert AVI files to iPod for Mac? How to convert video to iPod MP4 files for playback on Mac? How to convert FLV (flash video) to iPod videos on Mac?